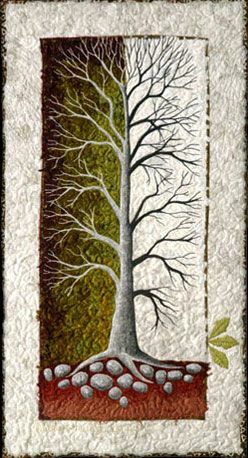 This quilted and embroidered wall hanging is part of my Saving Paradise exhibition that toured Ontario galleries from 2003 to 2004. To prepare for the exhibition, I documented 17 rare or endangered Ontario tree species for an entire seasonal cycle, noting visual characteristics from bare branches in early spring to the drop of leaves in the fall, and from bud to flower to seed. I researched my trees from various perspectives, environmental, medicinal, cultural, spiritual, and aesthetic, and consulted with the staff at the University of Guelph Arboretum for additional insights. By the time I was ready for the drawing stage, I was thoroughly in love with every one! My goal was to record my emotions about these particular trees, to present each one at its most beautiful and fascinating, and to be the medium by which the public can begin to love and appreciate what they may never see in nature. No life form is more crucial to our well-being and ultimately to our very survival on this planet than the tree. All these pieces are wall hangings, made with a variety of fabrics and threads and machine quilted. To see the entire collection, click HERE. And for many more Native Trees (it's a bit of a passion) click HERE.